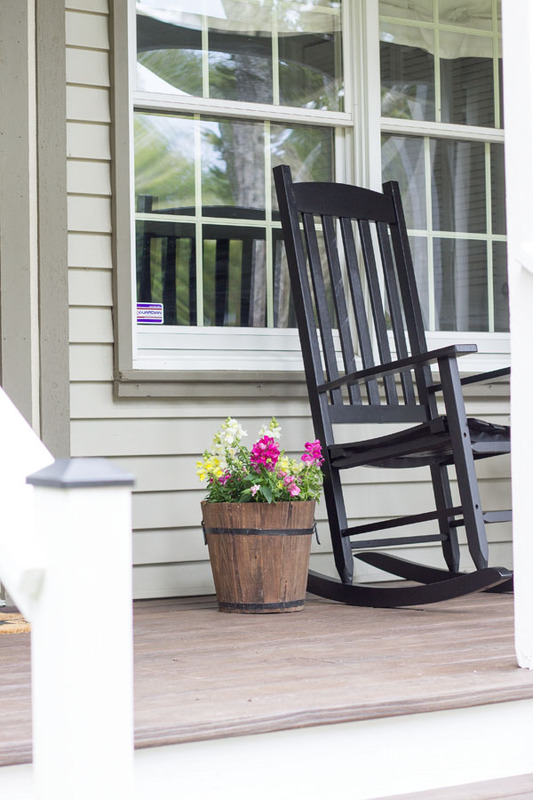 I've always daydreamed about having a big front porch where I could relax in a rocking chair and enjoy being outside. 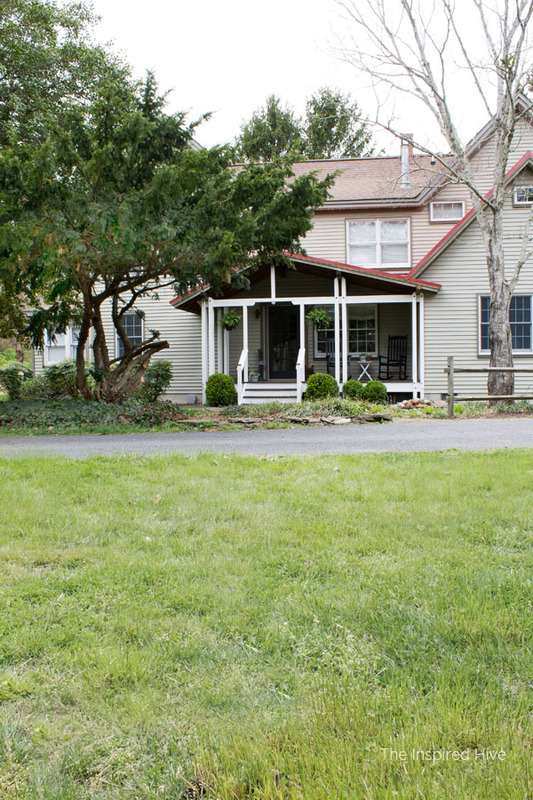 When we moved into this old farmhouse last summer, that dream came true. Except it sat empty and dull until now because we were in the throws of life with a newborn and unpacking boxes at the same time. 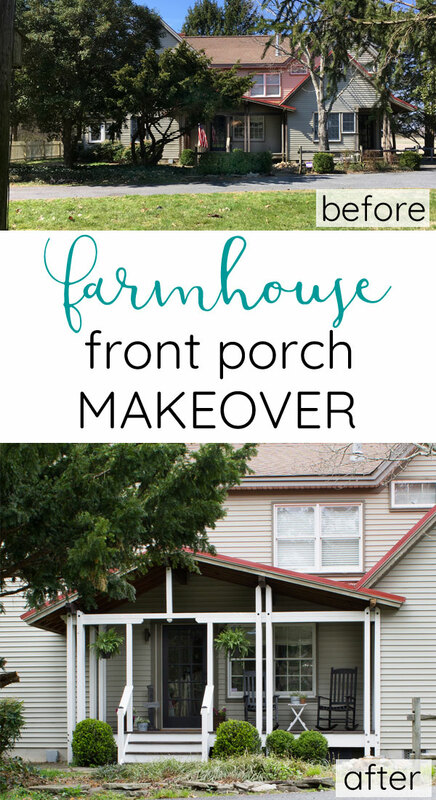 Now that life is settling down a bit, we are excited to tackle some outdoor projects, and I of course made sure the porch was at the top of our to do list! Our porch is pretty unique. We're pretty sure one of the prior owners was a woodworker. 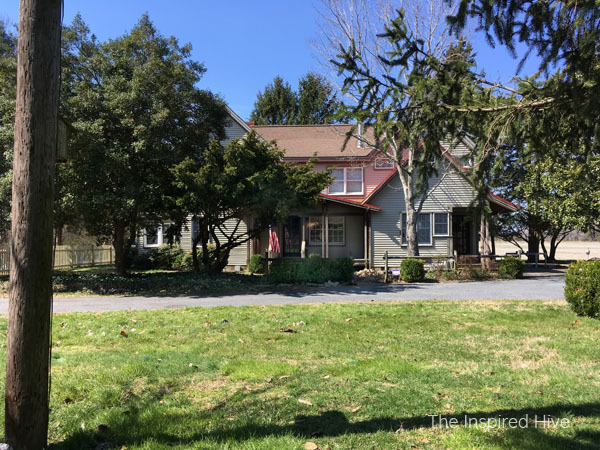 The oldest of the four sheds on the property has evidence of being a workshop and there is a lot of custom woodwork in the house that is not original to the farmhouse. 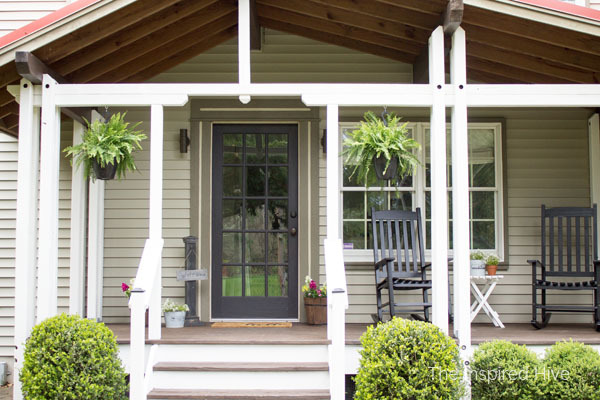 The porch is one of those examples. It has four huge cedar support beams. 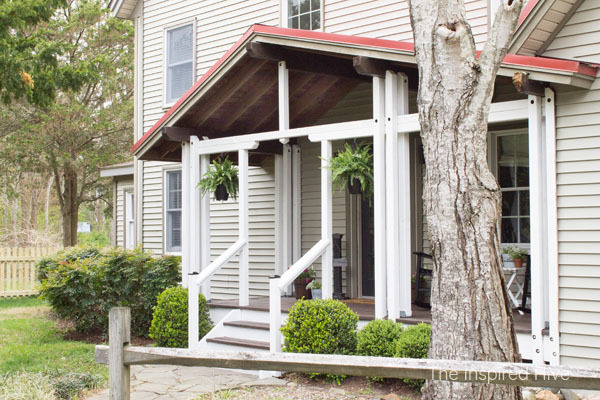 Each beam is nestled between four cedar posts, and there is a vertical piece in the gable of the porch. 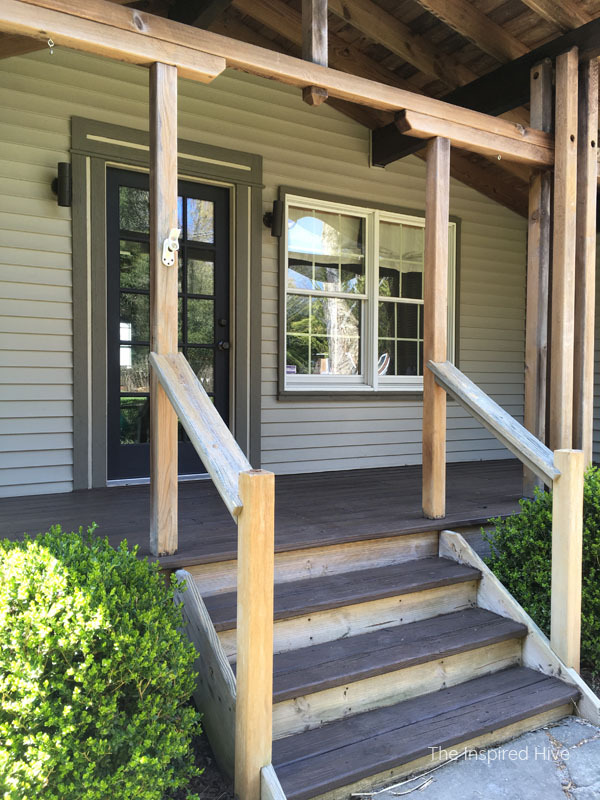 It's a unique twist on the post and beam porch style often seen on Craftsman style homes. This post is in partnership with HomeRight. All opinions are my own. 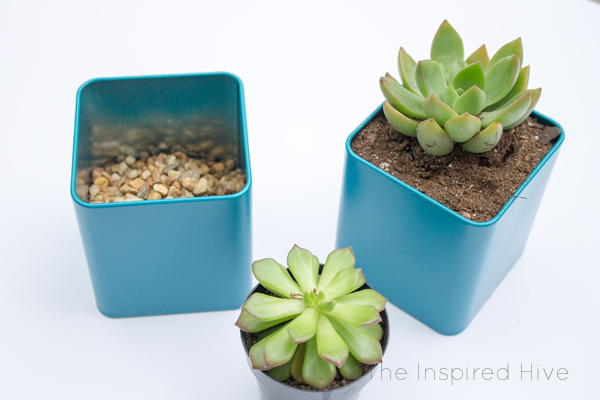 I only share products I love and that will help you in your own DIY projects! 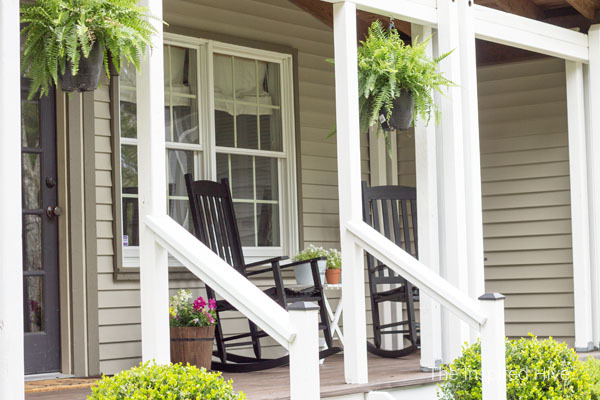 Our porch is also unique in the way our house is positioned. Instead of looking out at the road, the front of our house overlooks our yard. So I'll be able to sit in my rocking chair sipping on lemonade (or more likely coffee 😉) and watch the kiddos play outside. Needless to say, I was really looking forward to tackling this project!!! 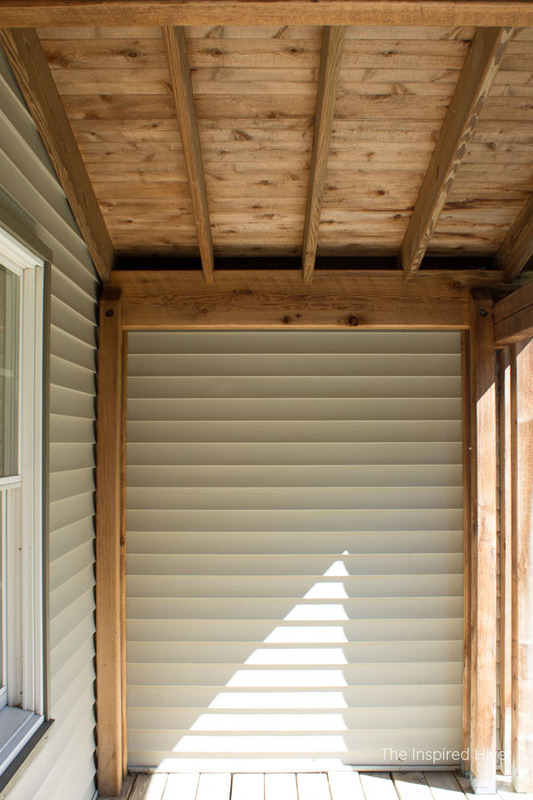 I knew this project was going to take a while because we would be at the mercy of unpredictable spring weather and had lots of wood detailing to work with (and children to juggle), so heads up, this did take us a few weekends. 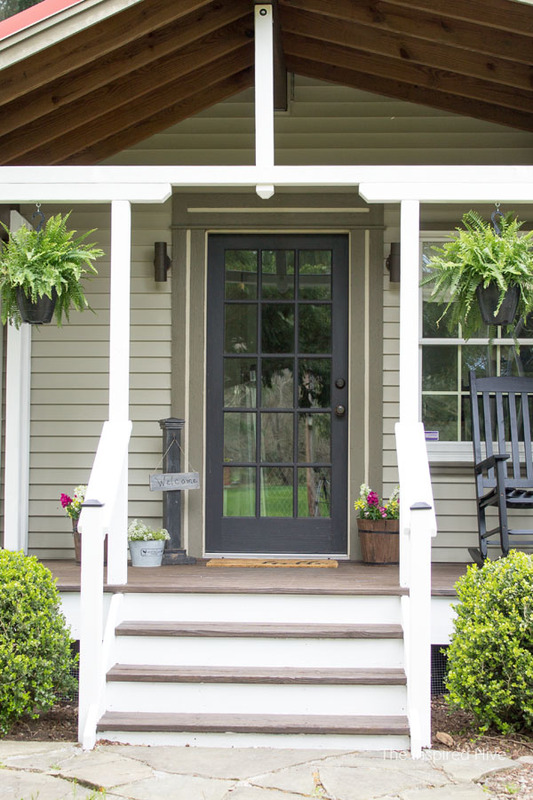 But if you have a less rainy climate, less wood work, or less nap times to juggle, you could easily update your entire front porch in a weekend. 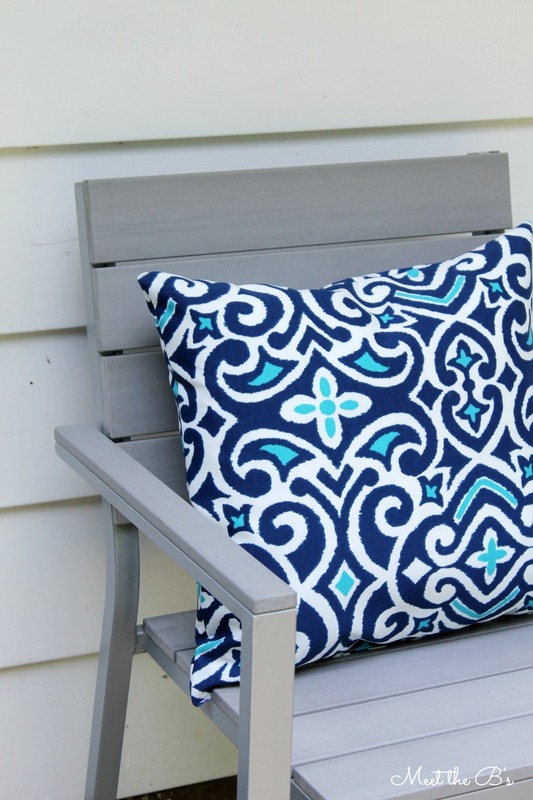 However, if you're a busy momma like me, you are probably also constantly looking for time saving methods for completing big projects like this. 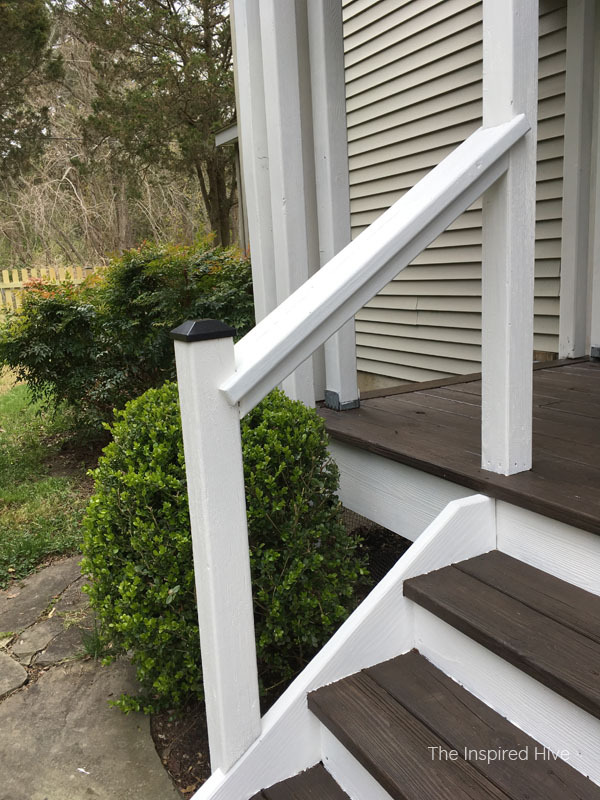 As long as this project took me for the reasons mentioned above, it would have taken me twice as long if I hadn't used the StainStick with Gap Wheel from HomeRight. 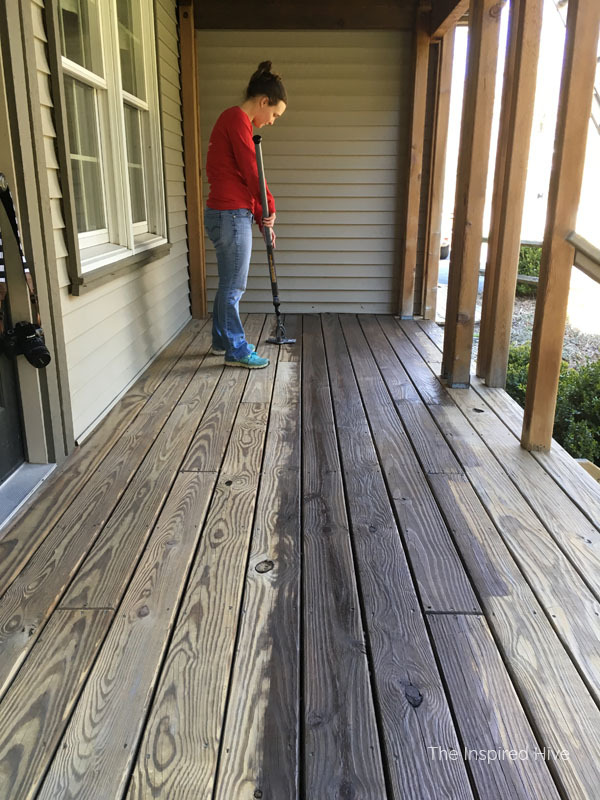 It's one of their many fabulous Deck Pro staining products and allowed me to complete the actual floor of the porch in just one afternoon!!! Prep your surface. 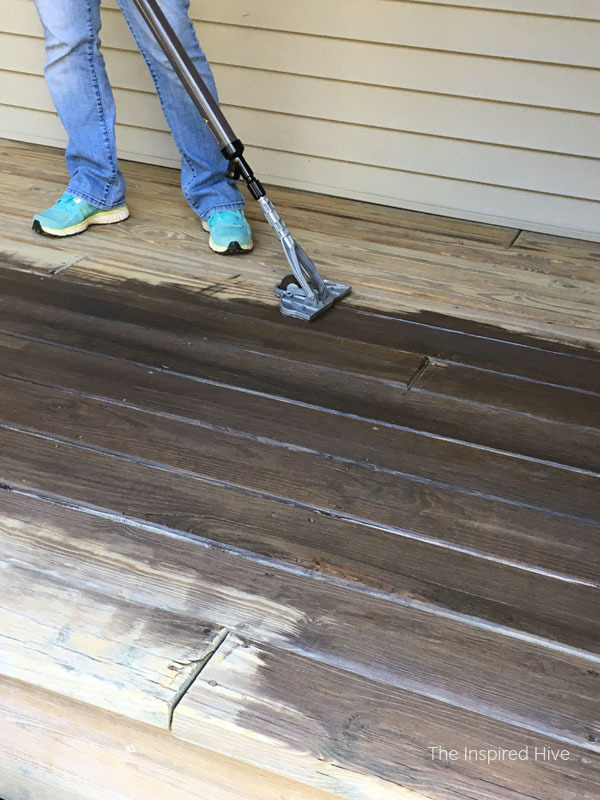 To help your stained surface last for years, you need to clean the wooden surface to remove dirt, mold/mildew, and any old stain or sealer. 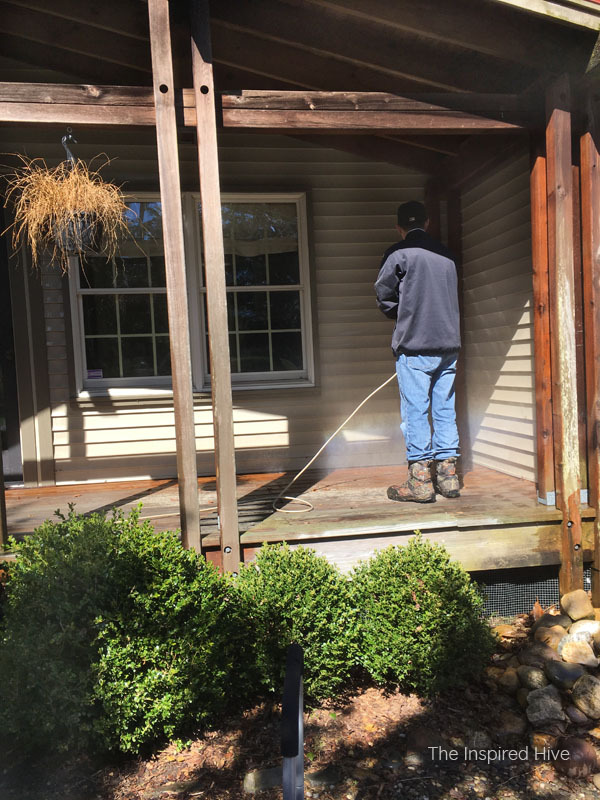 We used our small electric pressure washer to clean everything. Allow to dry completely before staining (probably about 24 hours). Start at the top and work your way down. You don't want any drips to land on a surface you already finished! For us this meant staining the large rustic cedar beams first. 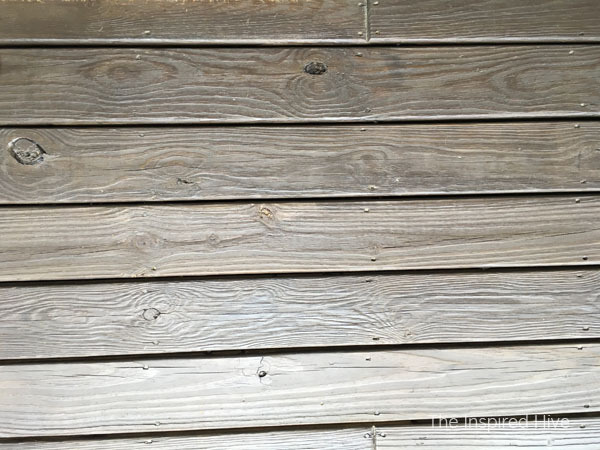 I used a brush to stain these. 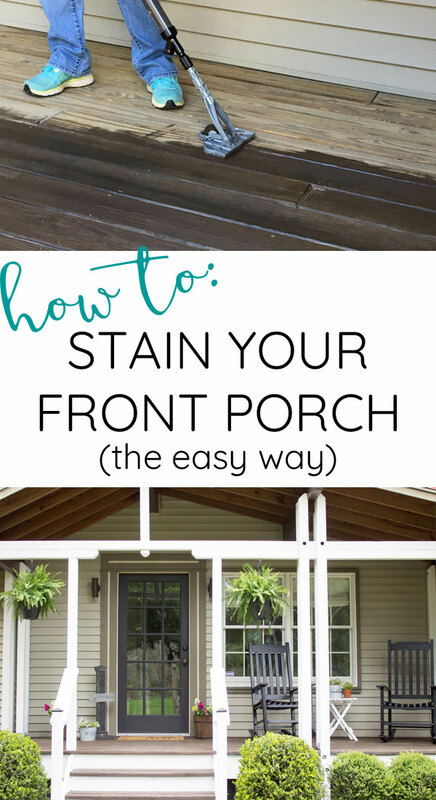 Stain the porch floor boards. 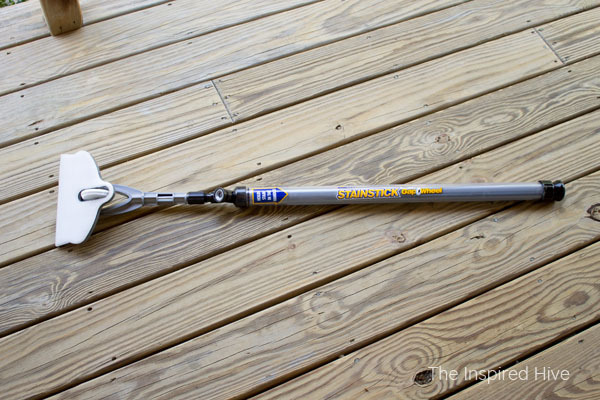 Make this part quick and easy by using the HomeRight StainStick with Gap Wheel. It holds stain in the handle so you don't keep going back to your stain bucket, and the gap wheel helps get stain in between boards. Plus, you can stand up instead of kneeling on the ground with a paint brush. It's seriously a game changer and makes this project go so much faster. The StainStick with Gap Wheel attaches to your stain bucket and you pull back on the handle to fill it. Then you just twist the handle to release stain as you push and pull the applicator across the wood surface. I stained the entire length of a board before moving on to the next section. 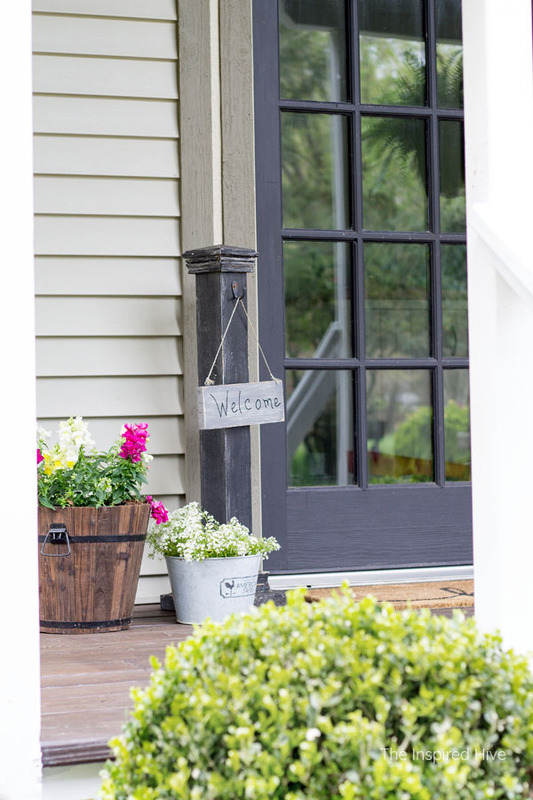 I also worked from the outer corner of the porch, in towards the door so I could let myself inside when I was done. Alternatively, you could work from the inner corner, out towards the steps. Just be sure to think ahead so you don't end up walking on wet stain! 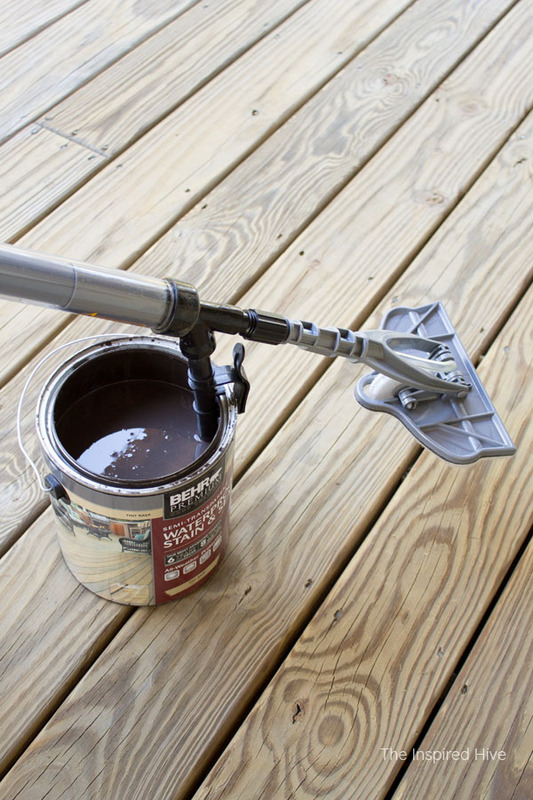 Apply a second coat of semi-transparent stain. Follow the directions on your can for when you can recoat. 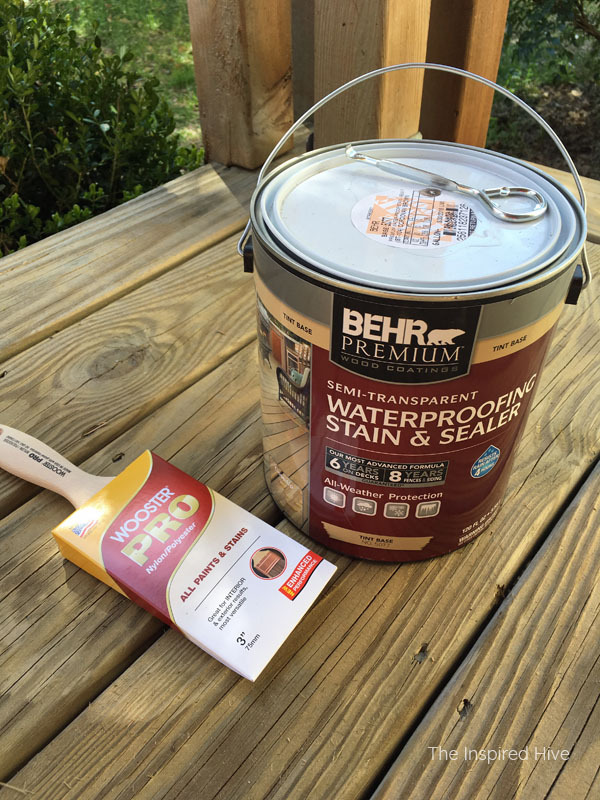 A second coat will help lengthen the life of your stain job and help prevent weathering. 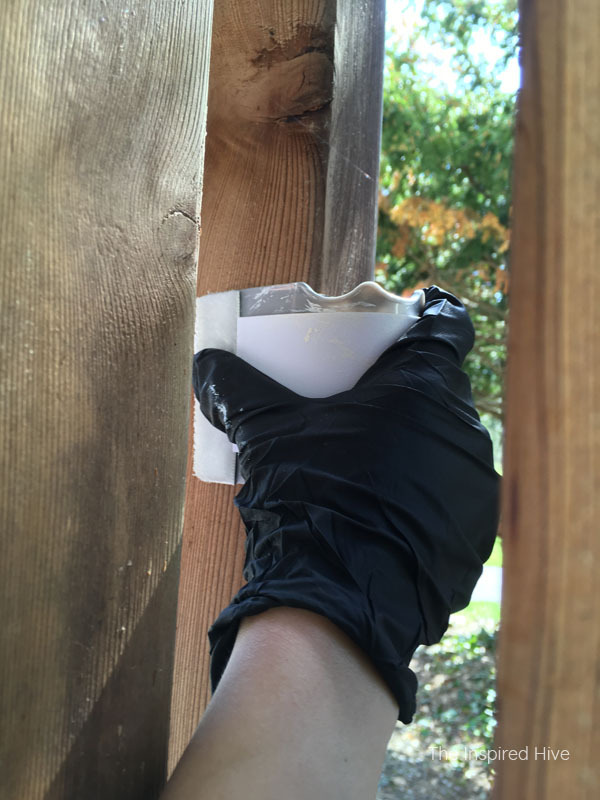 Use painter's tape to prevent the solid white stain from dripping onto the semi-transparent stain. 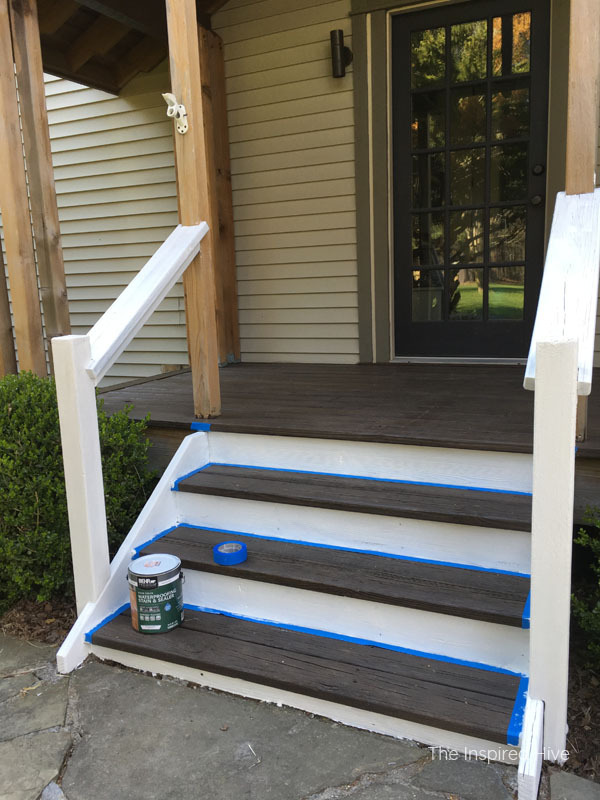 I taped off the steps and used a brush to apply the solid stain to the risers and railings. 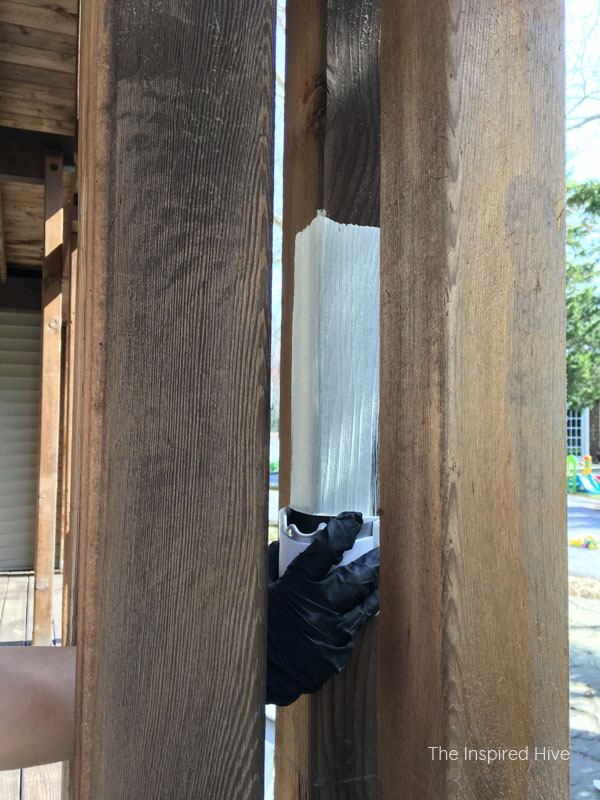 Apply solid stain to the posts. This was definitely the most time consuming part for us because the posts are grouped in fours with very little space between. Getting between each and every one was a slow process! For those of you that have single posts, this part will go much faster! 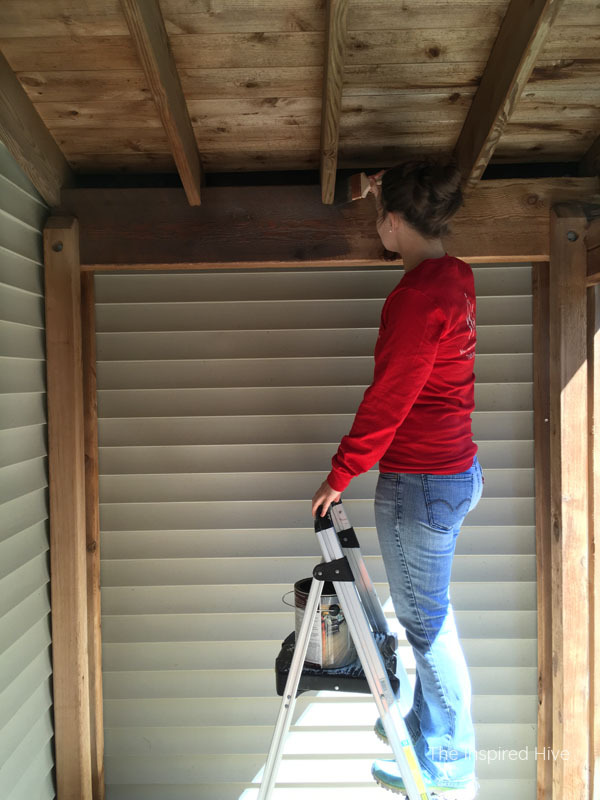 I used a brush on the outer sides of the posts, and the HomeRight Shape Stainer helped me do the inside corners where I couldn't fit a brush. 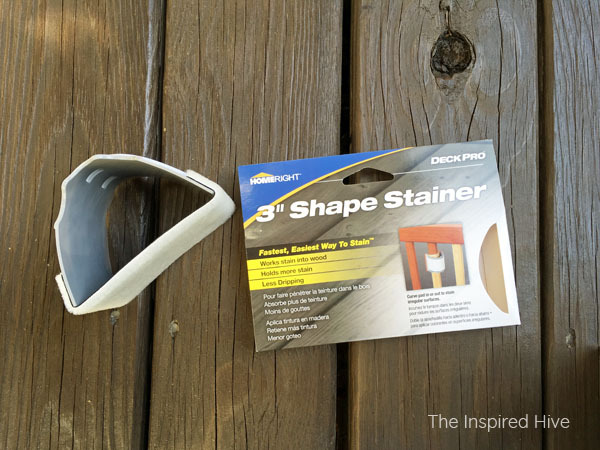 You just put some stain into your paint tray, dip the Shape Stainer in, and then bend it around your post, carefully dragging it across the surface to apply the stain. There were still some areas it couldn't get to due to the tight space, so I also used a short handled sponge brush in some spots. 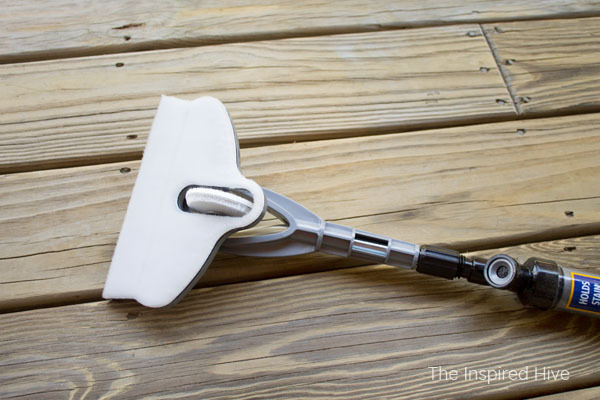 Allow to dry thoroughly before replacing any furniture or accessories. I recommend at least 24 hours to allow the surface of the stain to begin to cure. We still have a lot more to do to finish this space, but I'm amazed at the difference just staining the porch made!!! We also plan to widen the stone walkway. We have a lot of landscaping and yard clean up to do. The area to the right looks like a mess at the moment, but a month from now, it will be full of blooming black eyed susans!! The view last summer was incredible. I can't wait for them to bloom! As I said, we took down the fence to the left to open up the walkway, but I think we will leave the split rail fence on the right. 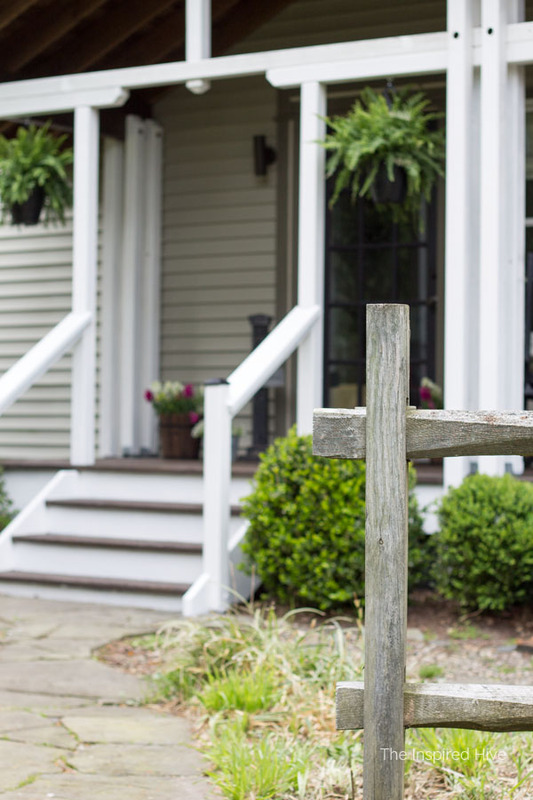 I love how it adds a touch of rustic wood and is a reminder of the home's history as a working farm. 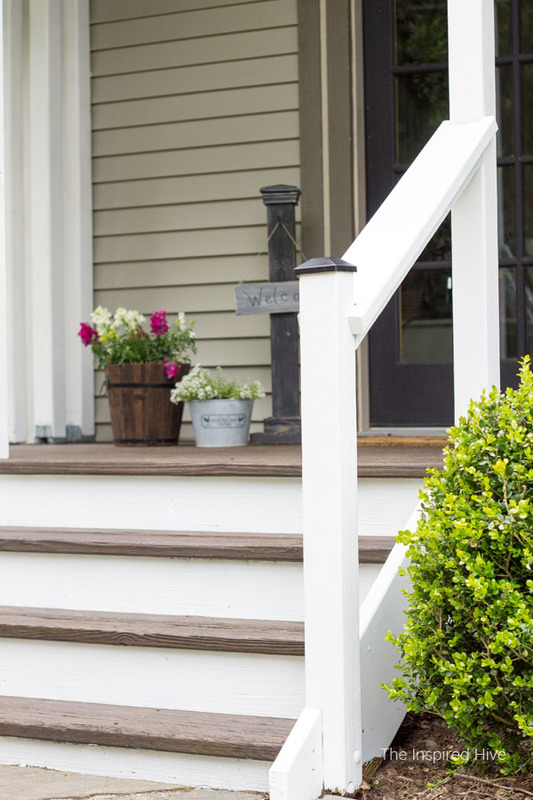 We added some simple black post caps to steps to protect the posts and add a more modern farmhouse feel. Ahhhh. And there's the rockers I've always dreamed of! I searched everywhere for some antique ones but couldn't find a set. 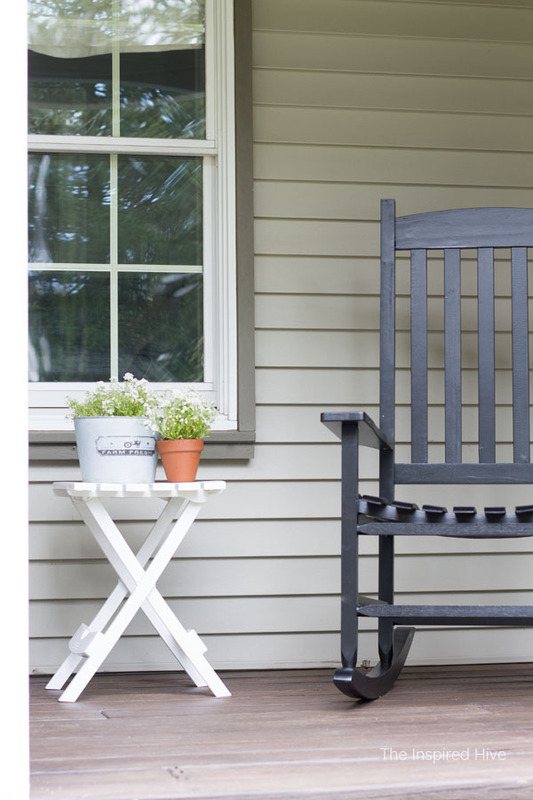 I settled on these affordable black rocking chairs instead. I'm still on the hunt for the perfect table, but for now, this $10 folding table I found at Home Depot works just fine! We also plan on switching out the light fixtures and and painting the door and window trim, so I'll have another update coming for you soon. 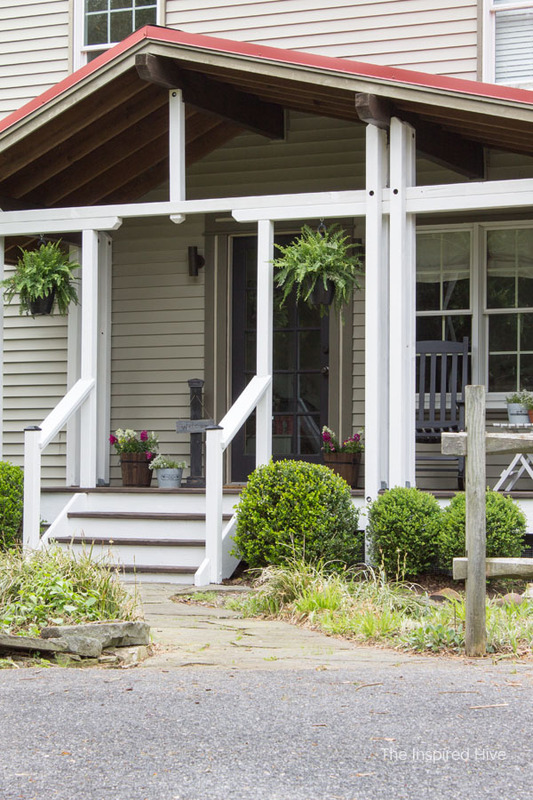 I'm thinking about painting the porch ceiling too to help those big rustic beams stand out more. What do you think? 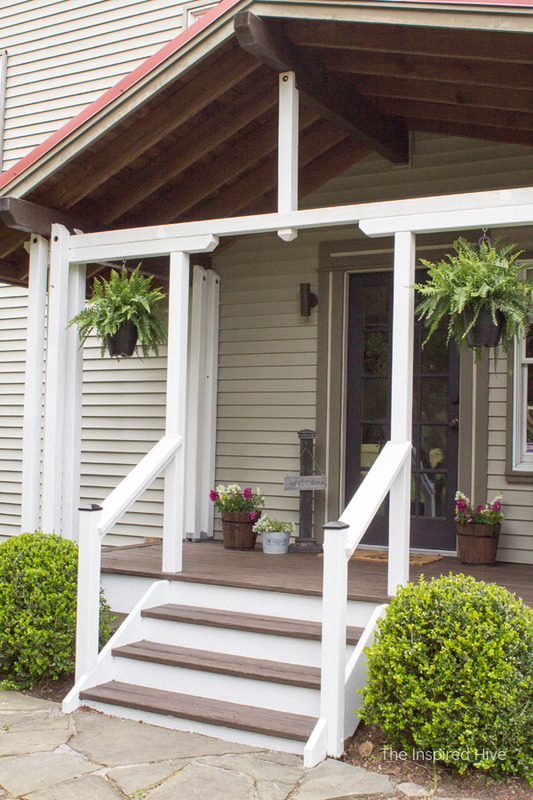 Your porch turned out great!